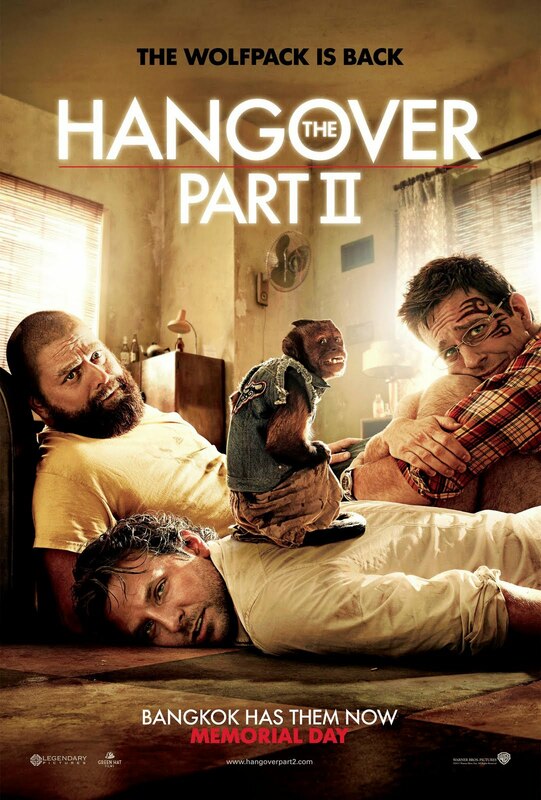 When it was first announced, I expected The Hangover Part II would be a rehashing of the first film. I knew that the formula would be similar and the premise exactly the same, but I held out hope that the creative team behind The Hangover would pull out all the stops, up the ante, and reinvent gags to their fullest potential. Here, they do push the limits of decency and taste (almost too much by the end of the film), but they never in any way try to give this installment its own voice. Sadly, if you’ve seen The Hangover, then you’ve already seen The Hangover Part II. This time around, the principal characters from the first film (Phil, Stu, and Alan) relocate to Bangkok in order to celebrate another wedding, that of Stu. Wishing only for a calm and collected wedding party, Stu denies the others the chance to throw a bachelor party. But when a celebratory beer on the beach turns into a blackout, the three find themselves lost in the midst of yet another labyrinth of alcohol, drugs, and debauchery. If the first film was about three men-children letting loose their inner monsters, then this film explores how far the id will go to terrorize even the seediest of places. Much of this would have been genuinely funny had the filmmakers decided to go a different route with the structure of the film. Rarely deviating from the formula of its predecessor, the only things that distinguish this film are the location and destruction. The Hangover Part II often plays as a greatest hits record, referencing numerous jokes from the first movie as if it were in on the laughs, many of which are not so much earned as they are forced out of discomfort. It’s one thing to exploit an awkward situation in order to earn a laugh, but the film exploits an entire litany of racial and geographical stereotypes in order to do so. Perhaps it would have been funnier to explore the true cultural differences between the U.S. and Thailand, but director Todd Phillips is content with half-realized assumptions and creating a Sodom-like environment. I’ve never been to Bangkok, so I can’t speak about its more depraved aspects, but I’m sure it’s nowhere nearly as lawless as the filmmakers portray it to be. In depicting this seediness, Phillips (and his screenwriters Craig Mazin and Scot Armstrong) up the raunch factor to an almost uncomfortable level. No joke is too taboo, and perhaps the filmmakers should be praised for their willingness to push the envelope, but there are a couple of instances in which their efforts are inherently cruel. The first of them involves a violent act against an animal, a senseless consequence of an ongoing plot device that is out of line and over the top. A happy ending is alluded to for said animal, but it was not the right place to go. The second involves the recreation of a famous photograph taken during the Vietnam War, a joke that stepped so far that it actually angered me greatly. The three principals (Bradley Cooper, Ed Helms, and Zach Galifianakis) do well with what they’re given, but the spontaneity isn’t there this time around. Their dynamic worked the first time because of their freshness and their eagerness to please. This time, I couldn’t help but feel that they were phoning it in and just going through the motions of a tired formula. This film had every opportunity to be great — not The Hangover great, but just great enough to warrant its place in the multiplex. In a summer riddled with sequels, this is one of the most highly anticipated. I wouldn’t be surprised if many patrons left the theater feeling a bit of deja vu. The Part II is a misnomer; the film would have to be a continuation of the original story in order to earn that title. The filmmakers should have instead named it The Hangover V. 2.0, for this is a not a sequel; it is a remake, and a terrible one at that.